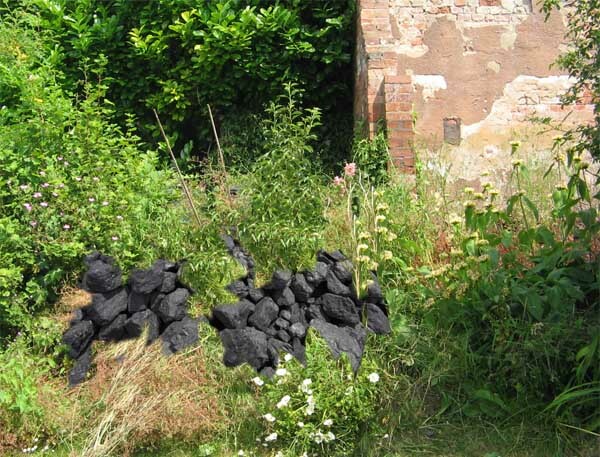 School teacher Martha Bankcroft, 29, was surprised to discover more than a ton of coal buried beneath dense weeds in the garden of the Bristol home she shares with husband Gareth, a local Community Support Police Officer. The couple moved into the terraced Victorian property in mid-March and last Sunday set about clearing the back yard of decades of rubbish when they made their startling find. Gareth’s 90 year old grandmother Alice Siggs suggested they burn it in their sitting room fireplace. After some initial reluctance, Gareth finally tried what he considered to be his nan’s daft idea but was amazed to see the coal burst into flames.